When the season changes to fall here in Howell, Michigan, a commercial landscape will need cleanup and maintenance. While leaves make a great organic mulch, they just don’t belong on commercial properties and neither do dead tree branches or dying shrubbery. 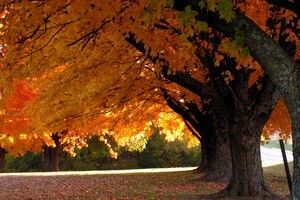 So fall cleanup service is a necessity for commercial properties. The landscape will need to be put back into shape before winter. Dead leaves, acorns, dead tree branches and more will clutter up your beautiful commercial property quicker than anything else other than discarded trash. During winter, you may need snow plowing or other seasonal maintenance. If there is debris under the snow, that process is hindered. Whether it’s snow that needs to be removed or a good fall season cleanup, a professional landscaper and lawn maintenance specialist like ours at Rainmaker Irrigation should service your commercial properties. You will want the fall cleanup to include removing debris, tree trimming, brush cutting, bush trimming, mulching, and anything else needed to clean up and shape up your commercial property for the season. Plant new shrubs and trees in fall. Cut back perennial plants such as liriope, lilies, and ornamental grasses in the winter. Edge planting beds prior to installing new mulch. Prune ornamental trees during the winter while dormant. A commercial landscape has maintenance needs that go beyond lawn mowing and leaf raking. The trees and shrubbery on a commercial landscape need to be taken care of by professionals who have knowledge and understanding of the particular tree and shrub species that are a part of a beautiful landscape. The trees on your commercial property can often be neglected and unhealthy if no one is ensuring that they have the right irrigation system, soil chemistry, and insect and disease control methods in place. Trees need plenty of water, good soil, and proper trimming in order to grow tall and strong. During the fall, the mulch beds should be renewed. The fall cleanup tasks should be done to remove any old mulch so a fresh bed can protect the trees during the winter. Some tree species will need to be pruned back during the fall cleanup while some should wait for another season. On a commercial property, there are going to be specific requirements that may include how high the trees are allowed to grow, how wide, and how low. There may be signage or a decorate architectural structure that needs to be taken into consideration. The fall season is an important time for shrub care. They need to have enough nutrition to last through the winter here in Howell. There’s a lot more to your shrub care than just trimming them back every once in a while. Shrubs do a lot for your landscape and it’s important they stay healthy and thriving. Shrubbery plays several specific roles in a commercial landscape. Bushes and shrubs add depth to the property. They can also hide unattractive but necessary structures such as exterior maintenance and trash collection areas, gas meters, and other unsightly features. Shrubs can act as barriers to pedestrian traffic flow as well as add beauty and design to the landscape. And depending on the species may require different watering needs, so ensuring your irrigation system is designed appropriately for your shrubbery is important. There are many shrub varieties that need to be taken care of differently. Knowing the type of shrub is imperative if one is responsible for caring for them. With these tips from our pros at Rainmaker Irrigation, your commercial fall cleanup will go well. If you need property maintenance service or a fall cleanup in Howell, call us at 734-564-1373 or complete our online form.